"RITZ spicy Asian chicken wings are delicious bites of sweet and spicy crowd-pleasing chicken, perfect for your Game Day party. The RITZ cracker breading adds a tasty crispy coating of buttery rich flavor that pairs splendidly with the Asian inspired sauce. 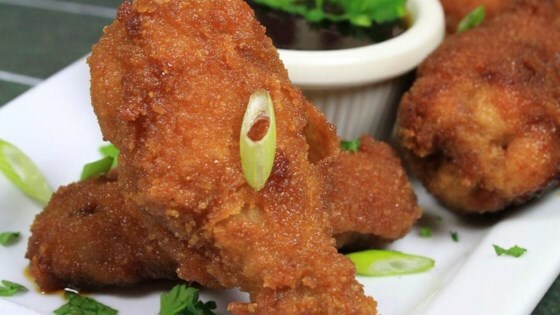 Everyone wins when you serve these yummy chicken wings!" Combine apple cider vinegar, soy sauce, water, brown sugar, Serrano peppers, ginger, and salt in a small saucepan. Bring mixture to a gentle boil over medium-high heat, stirring frequently. Continue cooking and stirring until reduced down by 1/3, about 20 minutes. The flavors will intensify as the sauce thickens and becomes syrupy. Divide the sauce, reserving 1 1/4 cups for serving. Rinse wings and pat dry. Place about a cup of crushed crackers in a bowl for breading. Dip a chicken wing in the beaten egg and allow excess to drip off. Then coat chicken wing with RITZ cracker crumbs. Place chicken wing on a foil lined baking sheet. Repeat until all chicken is coated, adding more crushed crackers to bowl as needed. Heat cooking oil in a 2.5-quart saucepan to 375 degrees F. Carefully place 3 to 4 chicken wings in hot oil and fry until crispy, 1 to 2 minutes. Remove wings with a slotted spoon and drain on paper towels. Continue to fry the chicken in this manner until all are crispy. Lightly spray two foil lined baking sheets with cooking spray. Using 3/4 cups sauce, lightly coat each chicken wing and place on foil lined baking sheet in a single layer trying not to crowd the chicken. Place baking sheets in the preheated oven and bake until cooked through, 15 to 20 minutes. An instant-read thermometer inserted near the bone should read 165 degrees F (74 degrees C). Allow chicken to rest for 10 minutes; serve with reserved sauce, cucumber, carrots and enjoy! Substitute: Prepare as directed using jalapeno peppers. But because Serrano peppers are spicier than jalapeno peppers, DO NOT seed the jalapenos in order to keep the heat intensity. Serve with cucumber and carrots. It was amazing, so yummy! Delicous! Made exacly as written.